“The twenty-sixth of July, 1957, was full of pleasant memories for the devotees and the residents of Sivanandaram, for Baba that day boarded a bus and proceeded along the bank of the Ganges to a place of the Rani of Garhwal for a quiet morning. “On the way back Baba stopped the bus at a place, where a thin little iron rod carried a half-distinct nameplate, 'Vasishta Guha' (Guru of Rama). He proceeded to descend the rather precipitous incline to the river bank, as if He had been there often before and as if He were aware of a prearranged engagement with the occupant of the cave. “The Ganga takes a wide curve near the cave; near-by a small rivulet pours her offerings into the Ganges, and so the scenery is doubly attractive. The Vasishta Guha bears a hallowed name; it has been sanctified by the austerities performed therein by many great recluses and monks in the past. Swami Purushottamananda a disciple of Swami Brahmananda of the Ramakrishna order, had been initiated into Sanyas (monastic life) by Mahapurushji, another direct disciple of Sri Ramakrishna. The Swami had been in the cave for thirty years. He welcomed Baba as if he too had been expecting Him! He was more than seventy years old and had spent the major part of his life in asceticism of a most rigorous kind and in the study of the scriptures. His face had the genuine glow of spiritual joy and the slightest mention of the glory of the Godhead sent him into samadhi (bliss). When he was a young man of twenty-seven, Brahmanandaji had read his palm at Kanyakumari and predicted that he would enter a cave and go on meditating and meditating. “Baba reminded him of the travails he endured when he first came into the cave, leopards and cobras and the three-day trek to Rishikesh and the desperate struggle for salt and matchboxes! He spoke of the succor that came to him through sheer Divine intervention! Baba repeated the visit the next evening in spite of a rumbling sky and the grumbling of some persons who accompanied Him. But, the rumbling ceased and the grumblers were humbled; by Baba's Grace, the sky became clear and the rain held back. Baba Himself sang a number of songs that day in the Vasishta Guha. When one of the Swami's attending to Swami Purushottamananda requested Him to sing a song of Thyagaraja, He very graciously asked him which of Thyagaraja's Krithis he most liked to hear. 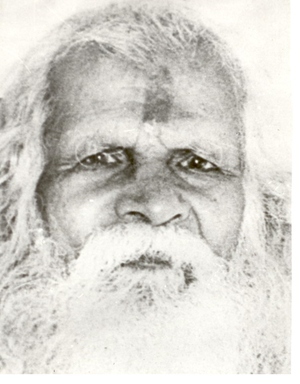 Swami Kalikananda said that he was longing to hear 'Sri Raghuvara Sugunalaya!' Baba sang it, just to make him happy. No one had heard Him sing that song before and so it was an unexpected piece of good luck for which we thanked Swami Kalikananda. Hearing that Swami had been suffering from chronic stomach-ache for many years, Baba took some 'candy' from nowhere and gave it to him, with instructions about diet, etc. He also gave Purushottamananda, a Japamala of shining Sphatika beads, which 'manifested ' itself in His hand.